The city of Jerusalem today has a population of more than 750,000. The current population in the Old City is about 35,000, 77% of which are Muslim. There are 2,387 residences in the Jewish Quarter; 2,461 in the Armenian Quarter; 5,276 in the Christian Quarter; and 25,248 in the Muslim Quarter (Peace Now Report, 8/22/2005). 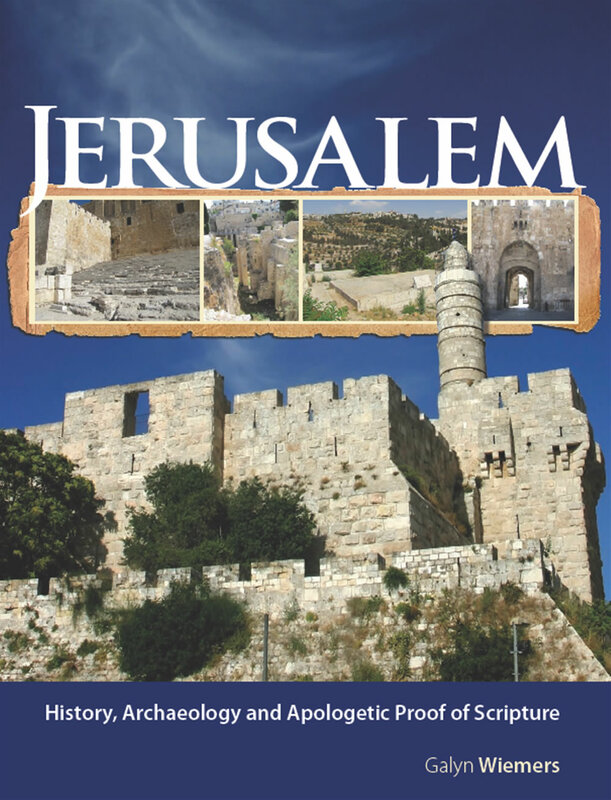 Jerusalem’s original location was not chosen because of its proximity to major roads. In fact, it is far from the international highways of the coastal plain and Transjordan. The closest major roads in Old Testament times were located a half mile to the west (the southern Ridge Route) and more than five miles to the north (running from Gezer to Jericho). The most desirable feature of the site was the natural defense provided by hills and valleys to the south and east combined with a difficult approach from the west due to climbing elevations and the deep rugged Valleys of the Judean hill country. Jerusalem sat on a rugged hill at the height of the hill country of Judea on local roads going nowhere and surrounded by the natural defense of valleys. This meant foreign invaders travelling through the land would often bypass Jerusalem entirely. 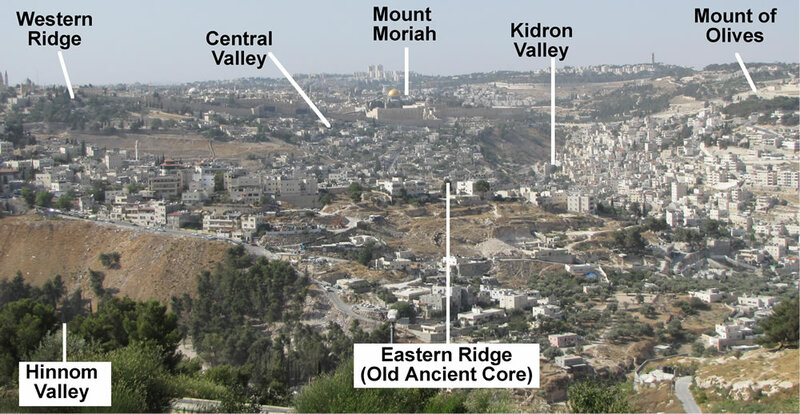 The original city of the Jebusites, which became the City of David, is located on a ridge south of Mount Moriah known as the Old Ancient Core. This ridge of rock (also called the Eastern Ridge) which became the city of Melchizedek, the Jebusites and David was lower than Mount Moriah to the north, lower than the larger Western Hill to the west, and lower and smaller than the Mount of Olives to the east. Yet, it was here on the western edge of the Kidron Valley, on the Old Ancient Core, that Jerusalem was settled. This particular location was chosen because it has the largest water source in the area. Water was continually supplied to this area through the gushing of the Gihon Springs located along the eastern ridge of the Kidron Valley. Ancient Jerusalem sat on several hills. The eastern border is the Kidron Valley. The Kidron Valley separates Jerusalem from Mount Scopus (aka, the Mount of Olives). The western border is the Hinnom Valley, which turns to run along the south side also, and meets the Kidron Valley. The spring of En Rogel is located at the meeting place of the Hinnom and Kidron valleys. The northern border is not defined by valleys, but is easily approachable and was the most difficult area to defend against approaching armies; thus, fortresses and towers were built on the north side of the city. The Central Valley (or, Tyropoeon Valley, which means “Valley of Cheesemakers”) runs through the middle of the city; this valley was filled in to level the city between the Hinnom and Kidron valleys. The Central Valley today runs from just north of the Damascus Gate along ha-Gai Street; it separates today’s Temple Mount from the Jewish Quarter. The Central Valley distinguished the Eastern Hill (City of David) from the Western Hill (which is where the city expanded to during the time of the Kings). 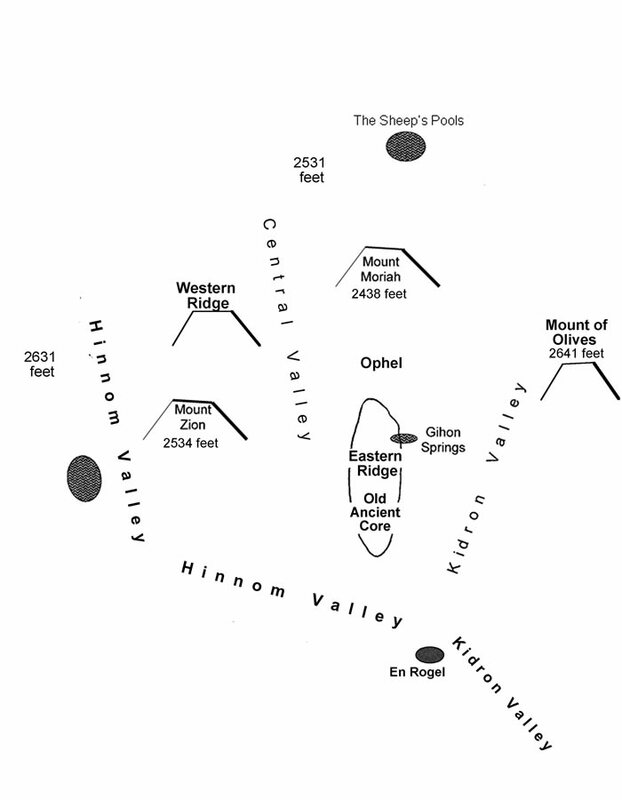 Mount Zion sits on the south end of the Western Hill, and the Hinnom Valley bends around Mount Zion’s west and south sides. The City of David sits on the Eastern Hill. The Gihon Springs are on the eastern slopes of this Eastern Hill and provide water for the city while also watering the Kidron Valley. Mount Moriah sits immediately to the north of the City of David and is, in a sense, part of the Eastern Hill. The area between the City of David and Mount Moriah on the Eastern Hill is called the Ophel. The city of David covers 15 acres; three of these acres are located on the slopes leading down into the Kidron Valley. Jerusalem is 33 miles east of the Mediterranean Sea and 14 miles west of the Dead Sea. Jerusalem is 3,800 feet above the level of the Dead Sea and 2,550 feet above sea level.